So I took a break from doing the flagstone patio - how could I resist a free trip to the sunshine and warm water? Press trips usually don't excite me but I just felt the need to get away, so I said yes, I would go. Because my flight left so early from Seattle, I spent the night at a seedy Best Western near the airport, where I could leave my car while I was gone. There's a free shuttle to and from the airport so it makes much more sense than getting up at 3 am to make the flight. I made a connection in Los Angeles and met up with some of the others on the trip. Boring flight, but that's better than an exciting one, I guess. After going through Customs and Immigration in La Paz - I pushed the button and got a green light thank goodness (those who get the random red light end up with a long inspection) - we were met by representatives of the CostaBaja Resort whose guests we were. Of course, stepping off the plane and into 95F was a shock and so was the bright sun! Good thing I had my glasses or I would have gone blind. 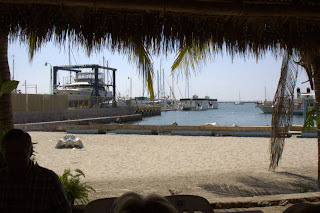 We loaded into two vans, and first stop was a cool Mexican restaurant on the beach near the boat yards. And that was the start of a three days of food! We sat in the shade and ate lobster tacos, skate tacos, guacamole and so many varieties of Mexican delicacies, I lost track. And we washed it down with Pacifico Beer, a true thirst quencher. We got a brief look at the town, as we drove along the Malecon or waterfront on the way to the resort which is about five minutes out of town. The water of the Sea of Cortez is brilliant turquoise in the shallows, and changes dramatically with the time of day, angle of sun and depth of water. 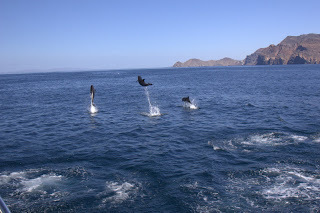 Jacques Cousteau called the Sea of Cortez the World's Aquarium. 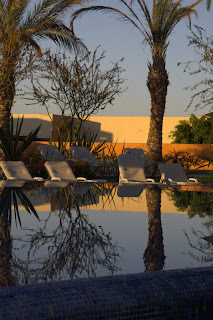 The resort is undergoing renovations as they want to bring it up to a five-star rating. It's got a ways to go, but my room was very nice with a lovely patio that overlooked the big boat marina. This place has it all - two marinas, condos, little stores, beach and they are going to be building a gold course designed by countryman Gary Player. Though heaven knows how you play golf in temperatures like that! Get up early, I suppose, and play when it is relatively cool. Soon they start building a whole slew of homes and also the spa - too bad that wasn't ready - it would have been fun to go for a massage. Our first night out was drinks at the Sunset Bar overlooking the marina, followed by a great dinner at Gula's, also on the marina, then a golf cart ride back to our rooms. The next day was in my mind, the highlight of the entire trip. Breakfast at the hotel on the deck - everything open and warm. A gorgeously still day, as we loaded onto a 30-foot SeaVee boat - tender to the boat we were to join. We hung on tight and flew along the coastline until, against the backdrop of one of the many islands that dot the Sea, we saw the 80-foot Ferrini yacht, with its crew, waiting for us to board. Oh my! I felt like I was back on Vadura! Everything was laid on for us, and we cruised along the coast of Espiritu Santo, and island that has been designated as a protected land and is part of the Nature Conservancy among other conservation groups. We tucked into coves and I dreamed of being on one of the sailboats anchored in secluded coves. They must have hated having this big old stinkpot disturbing their serenity. 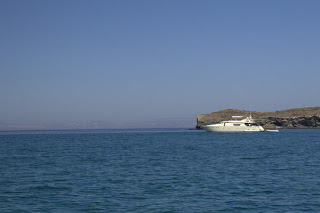 After an hour or so, we anchored off a couple of small rocky islands that we heard - and smelled - from a distance. Our skipper insisted we wear wetsuits so we struggled into them, working up a sweat as we did so, slipped into masks, snorkels and fins and fell into the 75F water - why did we have wetsuits! Anyway, we swam towards the rocks and you could see all the sea lions lining the shore, barking and sunning themselves. When they saw us in the water, the babies came out to play. They swam around with us, diving and surfacing almost in our faces, then swimming away, rolling over and simply being babies! What a treat! The water visibility was about 40 feet or so, and there were thousands of fish just waiting around to become sealion lunch! The rocks were all white, covered with guano from the frigate birds, terns and seagulls. anchor and went off to a cove for lunch. So then out comes the food again, platter after platter - shrimp, stuffed clams, backed sea bass, all sorts of empanadas, tacos, tortillas, vegetables. We just wanted to say STOP, enough already! And of course, it was all washed down by ice-cold beer. After everyone had had enough swimming, or kayaking as some didn't want to swim, we upped beer. I paced myself though, and went for another quick swim, sans wet suit this time. This is what I dream about when the weather here is awful - diving off the back of a boat into clear, warm water. So now I have a recent memory to fall back on. Heading home, we came across a huge school of dolphins that kept us entertained, swimming alongside and surfing the wake, jumping and playing - what a treat that was, I wished I had my long lens but made do with what I had and got some pretty good shots. Dinner that night was in town at a place called Buffalos - it wasn't my favorite, the main feature was steak and more steak and Mexican wines but apparently it is well-liked by the tourists. As we arrived, a bundle of people came falling out the door, absolutely wasted, yelling and screaming and one of the men hit one of the women in the group, who landed on her knees on the sidewalk. We were all aghast and hung back until the proprietor came over and told us it was OK! The food was ok, the service excellent. Then Wayne, who was the resort representative took us to his favorite ice cream place - this is one thing the Mexicans excel at - mine was one scoop each of mango, coconut and pineapple. How tropical can you get! 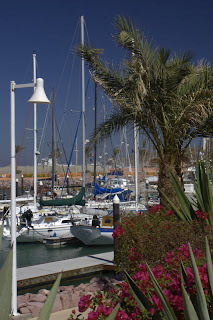 The next day, we got the marina tour, which was very interesting, obviously from my Dockside editor standpoint. And we got the sales pitch and layout of the proposed expansion and then headed out to see the property from a lookout high on the hill. That was very impressive. The lookout is in the middle of what will be the golf course and housing areas so the views from these will be spectacular. Carved out of the desert, all the water comes from a desalination plant, apparently a requirement for getting approval to build. But it being Mexico, many of the new developments build their houses, promising water, and when the time comes, the tap is dry! So buyer beware! Lunch that day was under the palapa in my favorite spot. To me, that was Mexico. 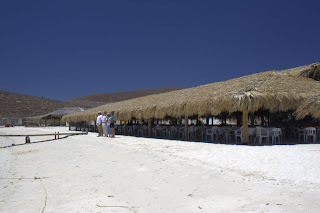 Right there on the beach, the chairs sinking into the sand and a soft breeze keeping us cool, I had garlic fish. So fresh and so pungent but oh, so good! And of course, you got it, a Pacifico beer! 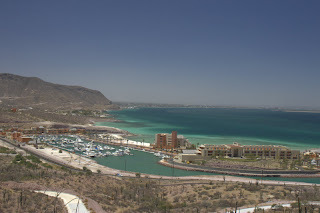 Later in the afternoon, we had the use of the yacht tender, and took a cruise along the coast to La Paz town, ducking into each marina to get a good look. It was quite windy so getting there was slow. The return was a flyer and we got back to the hotel in time to clean up and go out for dinner at Tres Virgenes - the Three Virgins. A great restaurant, half inside, half out, with great food and good company. The specialty was Chilean wines which all managed to sample quite nicely. The next morning, we were all getting ready to leave. Some left early some mid-day and I was scheduled to leave at 3:30. But we wanted to see the potters who make a very special pottery in town. So we found the place and watched the old man as he turned his plates and pots. We couldn't take pix of the pottery itself, but it was ok to get shots of him. It's a three generation operation: Mum and Dad, sons and daughters and now grandkids all learning the trade. I spent the only money I had to spend there, buying two coffee mugs and a small ceramic mirror for the condo. 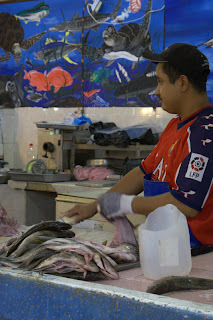 After that, four of us were dropped in town proper and we went into the real, local market where the stall are all open, the fishmonger was busy filleting fish, lots of fruits and veges and we were the only gringos there. My sort of place. A nice walk along the Malecon finished our time in La Paz and we took a nostalgic drive back to the airport. I got in to Seattle around 10 pm, picked up my car and was home by around mid-night. Fortunately, the next day was sunny and warm to ease me back into Washington weather that showed its true form the next day - cold and gray! But I have my warm memories and lots of pix to remind me.